Nick and Carter have left Nice and, after sailing down the Italian coast, have dropped anchor at the island of Procida, just across the bay from the Naples coast. Nick, as he is wont to do, meets the one homosexual who works at the local post office and, in short order, is invited to dinner along with Carter to meet the entire family. Italians, after all, are so friendly! Meanwhile, Lord Gerald, their friend in British intelligence, has sent a cryptic telegram asking them to take a package over to Capri, an island on the far side of the Bay of Naples. When they dock at Capri the next morning, they find a dying duke, an eccentric earl, and a vigilant viscount all living together in a glorious villa dating back to the turn of the century. These are the final remnants of the once-thriving community of homosexual Englishmen who made the Italian island their sanctuary where they could live in peace as themselves. 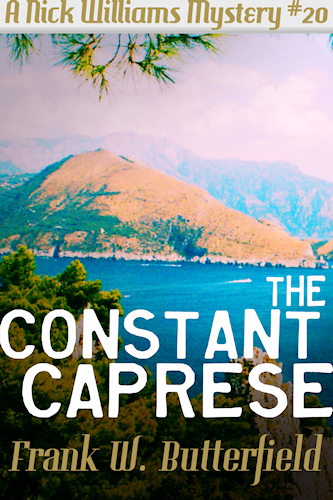 Come sail away with Nick and Carter to the Island of Capri and find out!